On view in the MacKinnon Gallery of European Art through Aug. 19, the exhibition marks the first time the museum has collaborated closely with masterworks lenders to showcase the work of a single artist. The exhibition is drawn from the Peterson Family Collection with an additional loan from Emilia and Tad Buchanan. 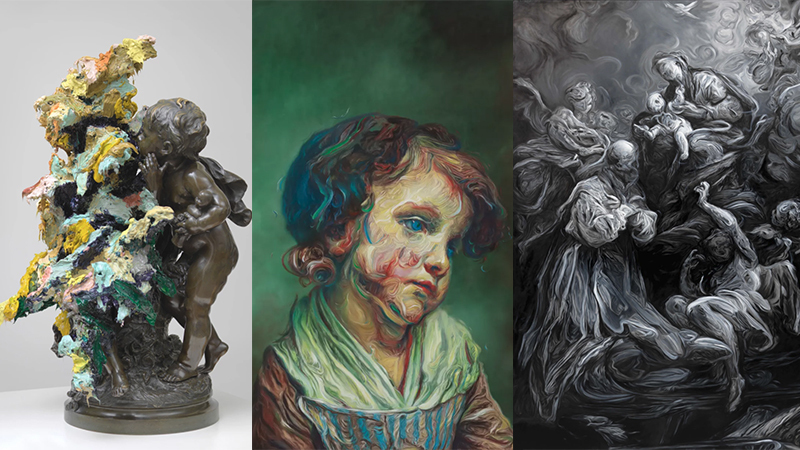 Together, the selected works provide a cohesive sampling of Glenn Brown’s diverse oeuvre. Seven of the chosen works highlight the paintings and drawings that comprise the majority of Brown’s output, alternating between direct and opaque references to masters of the Renaissance through the 19th century. Merging the mediums of drawing and painting, these pieces provide a window into Brown’s creative process and attention toward art historical conversations on brushwork and surface. A single sculpture completes the exhibition, demonstrating the means by which Brown adapts his techniques to a three-dimensional medium. Brown’s sculptures are an extension of his works on paper and his interest in merging mediums; they are envisioned as three-dimensional paintings that use bronze as their support instead of paper or canvas. Thanks to support from the Peterson Family Collection, a catalog accompanies the exhibition and includes an essay by Emily Shinn, a graduate student in the UO’s history of art and architecture. Born in 1966, Brown trained in Bath and London before securing his place of prominence in contemporary art. Finding inspiration in the art of the historical past, he embraces the concept of appropriation and uses it as a means to create original work without rejecting the rich history of style and iconography that precedes him. His works have been featured in numerous solo and group exhibitions across the globe, including Serpentine Gallery, London; Tate Liverpool, England; Frans Hals Museum, The Netherlands; Rennie Collection, Vancouver, British Columbia; Museum Stefano Bardini, Italy; Venice Bienalle, Italian Pavilion; Museum of Contemporary Art, Los Angeles; Museo Guggenheim, Spain; and more. Brown is represented by the Gagosian Gallery in New York and London and the Galerie Max Hetzler in Berlin and Paris.